Sometimes referred to as America's breadbasket, California is one of the top producers of fruits and vegetables in the nation. There are excellent growing conditions throughout the state, from Napa Valley (grapes) to the Central Valley (apricots) to the coastal regions (plums, guava), and many of the trees that are grown commercially can produce a good at-home crop of fruit. The U.S. Department of Agriculture hardiness zones 7 to 10 are represented in the state, though zones 8 to 10, which include coastal regions, the Central Valley and Napa, are the best growing zones. Apricot trees (Apricot) produce a small, yellow-red, fuzzy fruit with a sweet, soft flesh. Apricots grow best in California's central inland valleys and in northern California, about 30 miles or more inland, where there is some coastal influence. These trees can grow to 15 feet high and wide and produce fruit on old growth. Most varieties are self-pollinating. Apricot trees have plenty of pink or white blooms in spring and fruit ripens in late spring into summer. These trees require full sun and should be soaked several times a year. Guava (Psidium guajava) produces a small fruit with white, pink or yellow flesh that is firm and has a musky, slightly acidic flavor. The tree itself has large leaves--up to 6 inches long--and can grow to 25 feet. Guava trees do well in southern California, where nights are cool year round and winters are mild. Guava trees produce a profusion of white flowers in spring, and fruit usually ripens in summer. The fruit may be eaten fresh off the tree, and is popular for jellies and juice drinks. The trees are self-fertile, but may produce more fruit with a pollinator. These trees like full sun and moderate water. Plum trees (Prunus) produce edible fruit, ranging in size from small, red plums that are 1 1/4 inch across on the cherry plum (Prunus cerasfera) to fruit that is 2 1/2 inches across on the hybrid Hollywood (Prunus atropurpurea x duarte). Overall, plums do well in southern California, from the Los Angeles basin to the San Diego area. These trees are often deciduous and after losing their leaves will develop flower buds that open in spring and provide plenty of color and fragrance. Known as stone fruits, plums are good for eating off the tree, as well as making jellies and jams. Ornamentals that provide inedible fruit or no fruit at all, are also available and are often used as hedges. 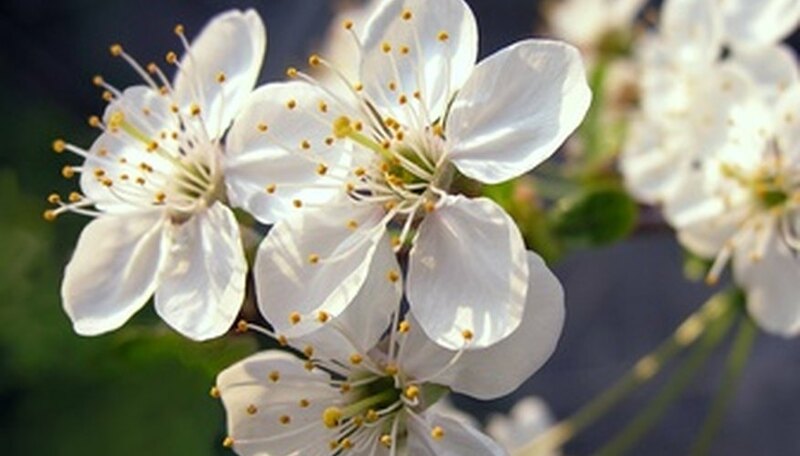 Plum trees, which are self-pollinating, should be planted in full sun and they require moderate to regular water.